The Gierre single ladder is undoubtedly the most widespread and well-known ladder model available in the Mister Worker™ catalog: useful to carry out a multitude of different jobs, the single ladders are light and very versatile. Gierre single ladders are the most comfortable and light work ladders available on the market, because they have the advantage of being compact and easy to transport. 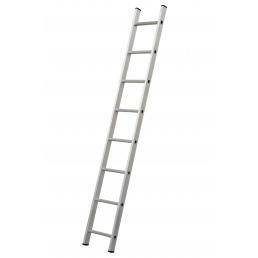 These are the professional ladders preferred by those with limited space, both in their own van and in their own work space, and are very easy to use. The only thing you should always pay a lot of attention to is the way you place them when you use them: they must be placed in a frontal position and placed directly on the work surface, so that they hold the weight well during use and do not move accidentally. All Gierre single ladders are equipped with anti-slip rubberized rubber feet, to guarantee maximum safety during use, and are produced in reliable and resistant materials such as aluminum and steel. A single work ladder allows you to reach a height of 6 meters: if you need to get higher, it is advisable to opt for an extendable telescopic ladder, much more versatile and suitable when carrying out jobs that require to arrive at different heights with a single scale. From the fruit-bearing scale to the flared base scale, Gierre offers only the highest quality professional scales, all certified EN 131 according to the legislative decree 81/08, to guarantee maximum safety during use. At Mister Worker™ you can find the full range of Gierre work ladders, all covered by the official guarantee of the brand.